Please face printed side upward and gently push in. When the ignition switch is on ACC or ON and power is off, power is automatically turned on if the CD is loaded. This CDP supports only 12cm CD. If VCD, Data CD, are loaded, "Er-6" message will appear and CD will be ejected. When car ignition switch is ACC or ON and if the CD is loaded, this indicator is lighted. If the CD is ejected the light is turned off. Push button to eject the CD. This button is enabled when ignition switch is off. 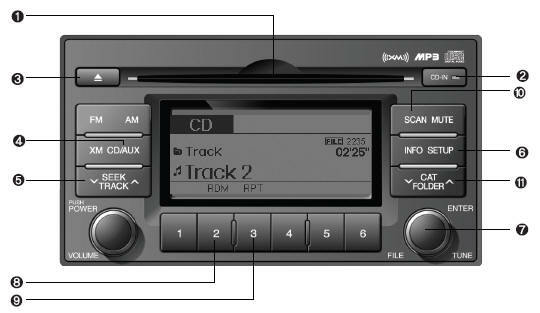 If there is a CD in the CDP DECK it turns to CD mode, and if a device is connected to AUX then it toggles. o Do not stick paper or tape etc., on the label side or the recording side of any discs, as it may cause a malfunction. o Depending on the recording status, some CD-Rs/CD-RWs may not be played on this unit. o Playback of MP3 and WMA file formats are suppored. Load to play time for these formats may be longer due to the compressed nature of these discs. 0.8 second to play from the beginning of current song. 0.8 second and press again within 1 seconds to play the previous song. to initiate reverse direction high speed sound search of current song. 0.8 second to play the next song. to initiate high speed sound search of current song. Turn this button clockwise to display songs after current song. Also, turn this button counterclockwise to display songs before current song. To listen to the displayed song, press the button to skip to the song and play. Turns on/off the randomization of the play list of files in the currently played DISC. To cancel the mode, press the key once again. Scans each song in the USB device for 10 seconds each. To cancel the mode, press the button once again. o Folder is moved up or down from currently playing and folder name becomes displayed. o Press enter key to play the selectedfolder. o If the enter key is not pressed with in 5 seconds, then the previous folder name will be displayed again. o To assure Proper operation of the unit, keep the vehicle tnterior temperature within a nomal range by using the vehicle’s air conditioning or heating system. o When replacing the fuse, replace it with a fuse having the correct capacity. o All stored bookmarks are all erased when the car battery is disconnected or power to the vehocle is lost. if this occurs, the bookmarks will have to be reset. o This equipment is designed to be used only in a 12 volt DC battery system with negative ground. o This unit is made of precision parts. Do not attempt to dosassemble or adjust any parts. o when driving your vehicle, be sure to keep the volume of the unit set low enough to allow you to hear sounds coming from the outside. o Do not expose this equipment (including the speakers and CD) to water or excessive moisture. o Do not insert warped or poor quality discs into the CD player as damage to the unit may occur. o Do not insert anything like coins into the player slot as damage to the unit may occur. o Do not place beverages close to the audio system. The playback mechanism may be damaged if you spill them. o Do not strike or allow anything to impact the audio system, damage to the system mechanisms could occur. o Off-road or rough sunface driving may cause the compact disc to skip. Do not use the compact disc when driving in such conditions as damage to the compact disc face could occur. o Do not attempt to grab or pull the compact disc out while the disc is being pulled into the audio unit by the self-loading mechanism. Damage to the audio unit and compact disc could occur.